Proceed with caution: here be spoilers. 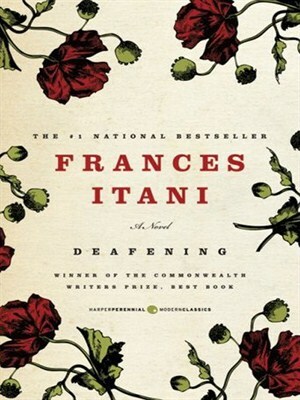 Deafening is a beautiful and poignant novel set in Deseronto, Ontario, Canada and in the trenches during the First World War. The novel tells the story of Grania O’Neil, a woman who lost her hearing to scarlet fever as a five-year-old. This book explores “death” in distinct forms; from the death of language in illiteracy, the death of potential in marginalization, to mortal peril from the Spanish Flu and the First World War. Mamo, Grania’s maternal grandmother and steadfast champion, sees Grania’s full potential and helps her achieve it. Grania recovers language as she and Mamo work through painstaking one-to-one lessons from The Sunday Book . It is Mamo who argues for Grania’s education, urging her parents to send her away to the nearby School for the Deaf. Mamo’s boundless love is not without its costs: once students at the School for the Deaf enter in September, they’re forbidden from seeing family members until the following June and Grania and Mamo are deprived of one another through the long school year. Later in the novel, Mamo sacrifices herself, refusing to allow anyone else into Grania’s sickroom when Spanish Flu strikes. In nursing Grania back to health, Mamo catches the flu and falls victim to the pandemic. It is the scenes with Mamo and Grania, and Grania after Mamo’s death that are among the most poignant in the book. This was a book I enjoyed much more on the second read. With full understanding of the plot, the second read reveals even greater depth in the connection between Grania and Mamo as we truly learn what and where they go and do when things get bad, a form of release and a coping mechanism Grania eventually reveals to her sister Tress in a bid to help heal her war-damaged husband Keenan. Deafening is worth your time.